Over the weekend we had the privilege of celebrating two special pirates boys 5th birthday (they're twins). 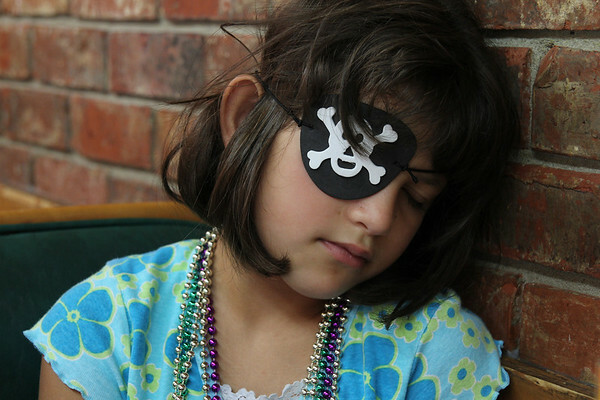 All of the festive pirate games and activities and cake and presents and all around general LOADS OF BIRTHDAY FUN (sorry for all the shouting) got our little pirate's mind whirring about her own upcoming birthday. And we're just now talking about it. What? Is that too large of a planning window? Believe it or not I am a fan of the home birthday party. Sure I stress out and am positive nothing will be ready in time, but I like the idea of celebrating with friends at home best. The trend among her school friends though is to invite everyone in both classes, which has the potential of being 22-24 kids. She has friends in both classes anyway, and we certainly wouldn't want there to be hurt feelings over not being invited (these second graders talk), but the idea of that many children in our home sends shivers of terror down my spine. 1.) Lego themed party at our home on a Friday afternoon after school. Invite both classes (22-24+). Sheer panic. 2.) Roller skating party (it's not as crazy expensive as I feared). Invite only the girls (10-12). Mild anxiety attack. I like the idea of the Lego party at home because this might be the last year she'll even consider inviting boys and girls, we can play a few party games and I can be creative with the invites, decorations, etc. Scott is afraid of that many kids playing outside on our trampoline and play set (which was knocked over in Hurricane Ike) and I can hardly wrap my mind around 22+ kids and parents milling around our home. The rollerskating party might be easier (good) but not as personal (boo). And that's as far as we got. All talky talky and no decisions. We've done both, the home, and the skating party. I don't rally have a preference, and the kids don't seem to either, as long as there is something to do at the home party. With the trampoline and play set they should be able to keep busy. You could always do just girls at home. Just depends on how many boys she's actually friends with. Can you check with another parent and see how many of the kids show up? She'll start back up with the boys at her parties when she gets to her teens. Mine will be 16 in two weeks and we haven't done any planning yet! She did say she just wants something at home. We've done smallish home parties, a bigger Star Wars party when she was in Kindergarten and just a family party last year. I wish she was of an age where she only wanted to invite a manageable number of close school friends, but she has good friends (boys & girls) in both classes. I also worry about hurting feelings. We've also talked about doing a girl only party at home--but don't really have a theme for that yet. At all the school friend parties we've been too there's always close to 18-20 ish--or more kids. Whatever you do, I know it will ROCK! I say skate party or girl party with a spa theme at home. Skate party sounds easy, and you can still have a theme and send out invites with it. At home spa party seems fairly easy. At least I hope it is because I told my soon-to-be 10 year old that she could have a sleepover party this year. Yikes. I think she--and we--are leaning toward the skating party this year. I like the idea of a girlie spa party/sleepover too--maybe when she's a bit older. Sounds perfect for your soon to be 10 year old! Both of these sound fun! Last year Griffin did a laser tag/space golf party and I thought it would be awful-- tacky, loud, etc. But it was awesome plus I had no prep or cleanup and did no party favors since I figured I paid for the laser tag and space golf, that was the favor!